Léon Herlant (1873-1968) Married to Céline Thirifays. No children. Doctor of Medicine, Doctor of pharmacology, Professor and from 1930 President Faculty of Medicine at the Université Libre de Bruxelles. Co-author with G. Billen in 1896 of the book Micrographie des poudres officinales. From amongst his autochromes we are especially fond of his Landscape in snow with the thick tree central placed in the foreground and the contrasting slender trees in the background. We can almost assume that Léon Herlant was attracted to trees when looking at Tree in focus a forest picture with a deformed tree center stage, some small light patches add a bright touch to the overall green tones. Like all autochromists Léon Herlant has photographed still life scenes, but Still life flowers and candlestick taken against a black background show surprisingly vivid colours within an overall 3D effect. 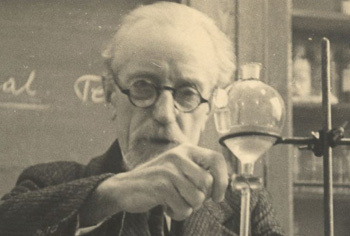 Portrait de L.Herlant © Collection Archives & Bibliothèques de l'ULB.